Improvising is easier than ever with this new series for beginning jazz musicians. 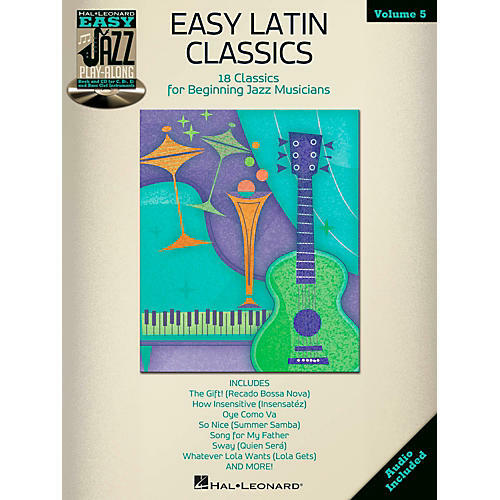 The Hal Leonard Easy Jazz Play-Along series includes songs with accessible chord changes and features recordings with novice-friendly tempos. Just follow the streamlined lead sheets in the book and play along with the professionally recorded backing tracks on the CD. The CD is playable on any CD player and is also enhanced so Mac & PC users can adjust the recording to any tempo without changing pitch. Volume 5 includes 18 songs: Baia (Bah­a) • Begin the Beguine • Black Orpheus • Flamingo • Gentle Rain • The Gift! (Recado Bossa Nova) • How Insensitive (Insensatez) • Once I Loved (Amor Em Paz) (Love in Peace) • Oye Como Va • Petite Fleur (Little Flower) • Samba de Orfeu • Slow Hot Wind (Lujon) • S³ Dan§o Samba (Jazz 'n' Samba) • So Nice (Summer Samba) • Song for My Father • Sway (Quien Sera) • Tico Tico (Tico Tico No Fuba) • Whatever Lola Wants.